I was very happy in dealing with TBDLiquids. I feel their customer service is high class. I made a small mistake and had to message the admins. They messaged me back within the hour and we were able to fix my mistake head on. I was impressed with the speed and humanness of the messages that we exchanged. I am glad to find that this company has a small town feel to it. It makes me feel like I am a small part of their business. This is a really hyped up juice that I tried in a sample bottle on one of my very first orders when I first started vaping. I really did not like it. It had a rotten taste to it. It is one of the worst juices that I have ever tasted to date. I detested it from the initial smell. I thought I hated all melon juices from the time I ordered it, but I have gone on to taste other melon juices and that is just not the case. I don't get the hype. Hat Trick Vapor has unique flavors, and great customer service. I really enjoy many of their juices. They come up with some of the most interesting names for them. When I had a problem with one juice, they made it right. They have an ongoing coupon code that I use every month. 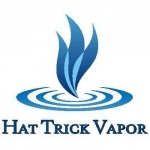 Hat Trick Vapor replies to emails in a timely fashion. I am happy to call them my number one juice shop! This tastes just like a fancy margarita. The lime and saltiness were spot on. I vaped the sample bottle very quickly. I loved how it tasted. I bet it would go good while drinking a margarita! I recommend this to anyone looking for a drink tasting vape. I wanted to like this juice more than I did. I had a hard time overcoming the hazelnut flavor to get to the chocolate flavor. I did enjoy it enough to vape 10ml of it. I know I will not order more of it. I would certainly recommend it to anyone looking for a hazelnut and chocolate mixed vape. This juice is a blend of chocolate and peppermint. During the inhale you get a subtle taste of chocolate and when you exhale you get a refreshing taste of peppermint. I enjoyed the taste of the two flavors a lot. The only downside was the peppermint was a little bit overwhelming and did not allow the chocolate to shine through. I relish ordering from this company. You can tell they put a lot of care into their juices. The way the juice comes packaged is unique to any company I have ordered from before. The larger bottles come in a cardboard tube with string wrapped around it with a wax seal, sealing it into the tube. I also ordered a couple of sample boxes and they came in boxes with string wrapped around them with the wax seal. Inside the cardboard tube the larger bottles come in is a note telling you the birthdate and the date the juice will be ready to vape. I find the attention to detail very nice. The juices I have tried are quite nice. I ordered in 8mg and 0mg. I enjoyed both juices. The 0mg was very flavorful. The 8mg was flavorful as well. I did not have to wait for very long for my orders to ship out. On the website if you do reviews of the juices you have ordered you can get Fancee points that count towards your next order. That is quite a perk. All and all Fancee Juice is a step above many vendors. This juice tastes just like the butterscotch candies that come wrapped up in the cellophane wrappers. It is sweet and tastes just like the candy. I let it steep for about 6 days. It has a good throat hit and produces pretty good vapor. I would recommend this to anyone wanting to taste something sweet and buttery. It tends to linger on the tongue for a couple of seconds after you get done vaping it. I can vape it for a couple of hours. I would not consider it an ADV, but it is good to have with coffee or after a hearty dinner. I liked this juice a lot. It has a heavy watermelon flavor with a hint of berries and a delicate nose of guava. The watermelon is quite a juicy vaping flavor, with the berries bringing in a back note with the guava like a note on top of the other two flavors. I had to vape on this about 30 minutes to fully experience the full flavor of it. I have not had a flavor quite like it before. I could tell they have spent a lot of time perfecting exactly how the flavors behave with each other. If you like melon flavors you will like this one. This juice is way too sweet. I tried it right out of the mailbox and it was spicy and very sweet. I tried letting it set for a couple of weeks and the spicyness settled down but it did not taste of much of anything else. I gave up on it and passed it along to someone else. I've never been able to order from this vendor. They seem like the mythical unicorn to order from about as bad as Alice in Vapeland. I have just given up on trying to order. This vendor goes above and beyond for their customers. Their shipping times are very short. They ship internationally as well. If your country is not on their shipping list they will add it if you email them first. They frequently do give away offers and discounts for their loyal customers. They have unique juices that I have not found in other vendors before. I really love how they lend a personal touch to all they do. You can really tell they have put a lot of time and effort into their flavor profiles in their different juice lines. They have premium juices and basic juices on their website. This juice blew me away when I first started vaping. This juce has elderberry, pear, and black currant. I have never tried a juice with elderberry in it before. This is some delicious juice. I am sorry I only ordered a sample of it. The elderberry tastes like something I have never tried before. The pear and black currant embrace the elderberry and grace your tongue with a flavor that is a once in a lifetime experience. It is a juice that I would suggest to anyone looking for a juice of a different color. I enjoyed this juice when I initally got it. I let it steep for 10 days and it seemed to get a weird flavor. When I first received it the lime was at the forefront and I really enjoyed that. As time when on the lime seemed to turn into more of a candy like flavor that turned me off. I would suggest that you order a sample and see how you like it before ordering a big bottle. I found this juice to be tart and tangy on the tongue. The pomegranate plays delightfully with the hint of lime with a back scatter of black currant. I use it as a palate cleanser after dinner. It is a lighter vape and it helps cleanse my tongue. When I tried this juice I was expecting a strong menthol. I was not disappointed. I gave this a 6 because I found it unvapable for me. If you are looking for a super strong menthol I would suggest this to you. It is basically unvapable on its own. I would think you would have to mix it with something to be able to vape it. I have it in a box to hopefully give away to someone in the future. Just be wary if you order this it is SUPER strong. The website says it is double strength menthol. That is what you are going to get. This is a vanilla flavor that is bursting with creamy delicious goodness. I vaped this 7 days after it was made. I tried it without really steeping it because I wanted to see how good it was. Boy was I amazed. I have tasted a couple of other vanilla juices and was not impressed. This juice blew me away. On the product page Clark says he marinates his vanilla beans for a while to get true vanilla flavor. He only has this for a limited time at different times of the year. When I saw it go up in December I picked up 15 ml to try and I could not be happier. I want to try mixing it with a few of my other juices to see how they taste. I got this as a sample and I enjoyed it so I ordered the 36ml bottle. I tasted creamy muffin with raspberry. I enjoyed the taste a lot. It is not an upfront vape. It is a subtle vape at best. Sometimes it can taste like an alcoholic drink though. I don't know if it was what I had eaten before I had vaped or what. That is the reason for the 7. I do like to vape it during the afternoons when I know I won't have anything in my mouth. I really enjoyed Peppermint Pattie from The Vapor Chef. I ordered it in 6mg at 50/50. I found it to be heavy on the mint but light on the chocolate. I tried it right from the mailbox so I would hope that with it curing a bit the chocolate would come through more. I would order it again though so I gave it an 8. Surely a do again juice.